South Carolina State players, including Damani Applewhite (35), react as Tyvoris Solomon is attended to during the first half of N.C. State's game against South Carolina State at PNC Arena Saturday, Dec. 2, 2017 in Raleigh, N.C. N.C. State won, 103-71. 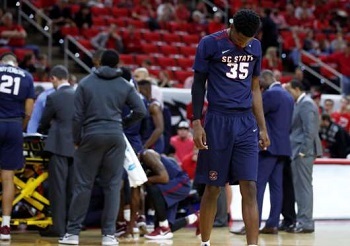 RALEIGH, N.C. - Wake County paramedics Greg Rodevick and Rich Eldridge ran across the PNC Arena court last Saturday, heading toward N.C. State guard Markell Johnson and his apparent knee injury. With a glance to his left, Rodevick saw S.C. State athletic trainer Tyler Long administering chest compressions to Bulldogs starting point guard Ty Solomon, who had collapsed in the team's bench area. "Our initial impression, we thought we were responding to knee injury," Rodevick said. "When I panned to the left, I thought 'This is a cardiac arrest.' We went from knee injury to, oh boy. We have a serious situation now." Les Jones, the lead official working the game, also had his eyes on Johnson, the N.C. State guard who had limped to the scorer's table and collapsed in pain while holding his knee. Play stopped with 13:08 left in the first half while N.C. State's medical personnel converged on Johnson. What would unfold over the course of 15 minutes at PNC Arena is a story of a seemingly healthy basketball player narrowly avoiding death while a team of medical professionals worked feverishly to save him. The scene caused 13,000 people in the arena to fall silent, brought tears to the eyes of coaches and officials alike and gripped a live television audience. After Solomon collapsed at the S.C. State's bench with the game action still underway, Long ran from the end of the bench to where Solomon had slumped in his chair. Jerome Jones, an S.C. State coach, came up behind Solomon and tried to prop him up while assistant coach Rio Pitt kneeled in front of him and tried to steady him. His teammates waved towels attempting to cool him. Eventually the unconscious Solomon was on the floor on his back in front of the bench chairs. S.C. State head coach Murray Garvin turned around and saw Solomon on the floor. "All of the sudden," Jones said, "I turn my head and this kid is laying on the floor, lifeless. The coach was just yelling, telling him to 'Get up! Get up!' and he drops right to his knees." With Garvin praying and begging for Solomon to wake up, Jones went to the scorer's table to ask that an announcement be made for a doctor to come to the S.C. State bench. PNC Arena public address announcer Tack Attayek complied with the announcement, but help was already on the way. Dr. William Jacobs, N.C. State's team physician, was making his way behind the scorer's table to the S.C. State bench. About 30 seconds later, N.C. State athletic trainer Austin Frank was also heading toward the S.C. State bench with an automated external defibrillator that is kept behind the N.C. State bench during games. "You have all these things in place for a situation like this but you never expect it to happen," Pitt said. Frank's work to provide the AED, along with Long's quick action to start CPR, meant the situation was aligned for Solomon's life to be saved. Rodevick said Solomon had no heartbeat and was not breathing when he got to him. "The biggest two components of this whole thing were Tyler was doing CPR and the AED was there so quickly," Rodevick said. After finding Solomon had no pulse and wasn't breathing, Eldridge and Rodevick used the AED to provide a single shock. With Dr. Jacobs kneeling next to Solomon, the EMTs hooked Solomon up to their monitors while Long resumed chest compressions. Within a few seconds, Rodevick said, Solomon began breathing again and a pulse was detected. "I think we had a pulse back within a minute of opening the AED," Rodevick said. "He was shocked and you could see his rhythm change. A minute in that instance is a lifetime." While all this was happening, PNC Arena fell silent except for cries and audible prayers. N.C. State's players gathered in a huddle. S.C. State players hugged others in the stands. N.C. State coach Kevin Keatts sat with and consoled a visibly upset Garvin. Jones, a Division I referee for 25 years and a familiar face at ACC games, found himself in a situation he'd not previously experienced. It brought him to tears. "It was unbelievable," Jones said. "You could hear a pin drop. You could hear teammates telling the young man 'Don't die. Don't leave us.' That was just heartwarming. You are looking at a young man laying on the floor lifeless and his teammates crying their eyes out and praying. It was just unbelievable." Even though Solomon began showing signs of life again, he wasn't out of danger. Rodevick used his two-way radio to call for an additional ambulance. One ambulance was already on hand at PNC Arena, but Rodevick requested an ambulance with a crew best equipped to deal with a life-or-death cardiac situation. That crew arrived within minutes and Solomon, now awake and moving his head, was put on a stretcher and wheeled out of the arena to the ambulance. "I woke up at the arena," Solomon said on Monday. "I looked up and saw people, but I really wasn't sure where I was at." Solomon starting showing signs of distress at 12:18 p.m. and play was stopped at 12:20 p.m. By 12:33 p.m., Solomon was being transported three miles to UNC Rex Healthcare's N.C. Heart and Vascular Hospital, where he spent the next five days in intensive care before his release on Thursday. Solomon returned to South Carolina to resume his recovery. His family has not released details of his condition. On his way home Thursday night he stopped by S.C. State's home game with Brevard in Orangeburg, S.C., surprising his teammates and coaches with a pre-game locker room visit. Solomon's emergency situation had a deep impact on many who witnessed it. During the 40-minute delay in Saturday's game due to Solomon's medical emergency, N.C. State sophomore center Omer Yurtseven was shaken enough that he called home to Turkey to speak to his family. "A situation like that makes you remember that those are the people that you care about," Yurtseven said. Jones spoke on the phone with Bryan Kersey, the ACC's supervisor of officials, to update him. But he also sent text messages to his family, including his sons who are athletes. "I texted my family and told them I loved them," Jones said. "I told my boys, they are both athletes, listen to your body." Rodevick and Eldridge deal with medical emergencies every day on the job. Saturday's was different because they worked in front of 13,000 people at PNC Arena and a television audience. They want people to realize the importance of CPR and AEDs. "I think the biggest thing is that you can do CPR and you can use an AED," Rodevick said. "Those are the most effective components. They are what saved his life." Both teams retreated to their locker rooms during the delay. Jones said he thought there was a strong possibility the game wouldn't resume. "It was up to the SC State," Jones said. "If they would have said we're not going to play, you can't make them play with those kind of conditions." In the S.C. State locker room, the decision of whether or not to finish the game was left up to the players. They voted unanimously to play because it was "what Ty would do." "They went into the locker room and made a decision for me that I would have made," Solomon said Monday from his hospital bed. "I would have said the same thing, to play. I'm glad they did get back out there. Still tried. Still played." When S.C. State's players ran out of the locker room to return to the court for warmups, the PNC Arena crowd gave them a standing ovation. N.C. State's cheerleaders lined their route to the court and cheered. So Jones, along with officials Bert Smith and Tim Comer, finished working the game. The next day, Jones and Smith joined Tim Nestor in officiating North Carolina's 97-73 win over Tulane at the Smith Center in Chapel Hill. But Solomon remained on Jones' mind. "At UNC the next day, I still could see that," Jones said. "I could see that young man. I was still concerned about that young man and his family and the other student-athletes who witnessed something of that nature. That's not something you see everyday."